His first exposure to theatre, he once told me, was his mother’s party turn, when she entertained guests by dressing up and imitating famous contemporary actresses. The act of “transformation and disguise,” as he called it, fascinated Cuker the child and would become a recurring element in his films. So many of them, major and minor, from WHAT PRICE HOLLYWOOD? through SYLVIA SCARLETT, CAMILLE, HOLIDAY, THE PHILADELPHIA STORY, GASLIGHT, A DOUBLE LIFE, ADAM’S RIB, THE ACTRESS, IT SHOULD HAPPEN TO YOU, A STAR IS BORN, HELLER IN PINK TIGHTS, MY FAIR LADY to LOVE AMONG THE RUINS, explore the dividing line between artifice and truth, theatre and life, who you pretend to be and who you really are. But the person who made these movies, was “perfectly sure of who he is, what he is,” as Cukor’s friend Lesley Blanch wrote in a letter to Kenneth Tynan, who quoted it in an article on Cukor for Holiday magazine. And because of this, she added, “he has not, or has passed, ambition in the destructive sense. He does not envy-is not eaten up by competition.” People who really know who and what they are, however, often find it unnecessary to announce the fact. As a result, Cukor’s work has been underrated by those who expect an immediate signature on a film, and imagine there’s no “personality” behind it unless they can respond to Buñuel-surrealism, Hitchcock-suspense, Fellini-grotesquerie or the Lubitsch touch. Even Tynan, in his Holiday article, could only come up with the comment that Cukor’s films “epitomize Hollywood at its most stylish.” The “Hollywood” label is an example of several meaningless ones that haunted his career: “essentially theatrical,” “women’s director,” “purveyor of glossy entertainment,” etc. The movies themselves, of course, dispel category-mongering. The “women’s director” discovered Cary Grant as a romantic comedian in SYLVIA SCARLETT, launched the careers of Jack Lemmon, Aldo Ray, Tom Ewell and Anthony Perkins as well as Katharine Hepburn and Angela Lansbury, guided W. C. Fields, Lew Ayres, Spencer Tracy and James Mason to performances that should have won Oscars, James Stewart, Ronald Colman and Rex Harrison to performances that did. Among his most personal films are LITTLE WOMEN, THE MARRYING KIND, PAT AND MIKE and A STAR IS BORN. None of them is glossy, and none of them derived from the theatre. Two things occur here. “Content” is seen as no more important than what the director does with it, and the best way to the cause is through the effect. Nothing is more quintessential Cukor, in fact, than PAL AND MIKE, that comedy without a belly laugh, that love story without an embrace. In the same way, GASLIGHT is a melodrama with no visible act of violence and the story of THE ACTRESS ends before she ever appears on the stage. No accident, either, that Andy Warhol and Paul Morrisey admired Cukor as much as he admired LONESOME COWBOYS, FLESH and TRASH. Like them, he did his thing and kept his cool, never moralized or intruded on his subjects. Yet they remain his, and no one else’s. Some directors reveal themselves through a single world. Others, like Cukor, through several worlds. Another clue to Cukor’s style is his treatment of the past. He approaches it as if it were the present. It is still there. New England during the Civil War in LITTLE WOMEN, Dickens’ England in DAVID COPPERFIELD, the pioneer West in HELLER IN PINK TIGHTS–none of these is self-consciously reconstructed, but comes as directly and vividly alive as Judy Holliday and Aldo Ray walking in Central Park, or Judy Garland as the unknown Esther Blodgett arriving at the studio in A STAR IS BORN. It’s a very special gift, making dramatic contact with whatever reality confronts him, and bringing it off through a combination of his own sensibility and imaginative research. Even when the material is spurious, in a potboiler like A LIFE OF HER OWN, the movie itself has nothing perfunctory or tricked-up about it. Too candid to make you believe in something false, it manages to suggest (as Cukor likes to say about his movies that have dated badly) a reality beyond the conventions. The director approaches his characters in the same way, without any bias except his belief in them. Three of Cukor’s films contain remarkable sequences of the disintegration of a man: Lowell Sherman in WHAT PRICE HOLLYWOOD? and James Mason in A STAR IS BORN before they commit suicide, and Aldo Ray when Judy Holliday leaves him in THE MARRYING KIND. The first achieves its effect with some disturbingly imaginative special effects, the other two by concentrating on the actor and his emotional response. About Mason in A STAR IS BORN, Cukor said that it was “a case of letting him find things out for himself.” As if the director knew exactly when to perform an act of inspired withdrawal, and let the moment take over. 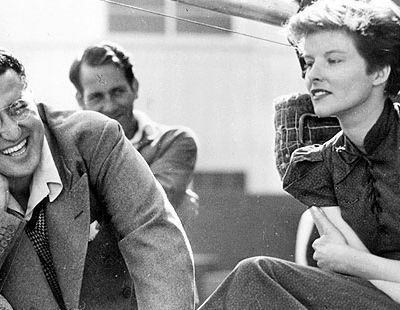 Although he made fewer films during the last ten years of his life, and most of them were not the ones he hoped to make, Cukor had great hopes for TRAVELS WITH MY AUNT, which would have been his ninth movie with Katharine Hepburn. But her typically outspoken criticism of the script angered James Aubrey, the new president of MGM, who fired her. Her replacement, Maggie Smith, was valiantly miscast and smothered in overly theatrical septuagenarian make-up most of the time, but wonderful when she played her own age in the flashback set in Venice. It was also the movie’s best scene, visually inventive and beautifully paced. But the movie as a whole proved Hepburn right about the script, which lacked the satirical edge of Graham Greene’s novel, and brought his Aunt Augusta too close to Auntie Maine. And the experience as a whole made Cukor uncomfortably aware that times had changed. There were now more disadvantages than advantages in working for a major studio. Aubrey was a former television executive primarily interested in developing TV series and action movies, dismantling the studio’s art, wardrobe and research departments, and trimming budgets. 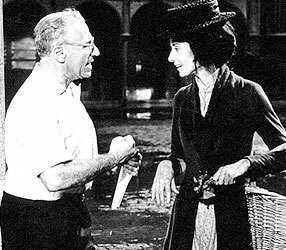 He canceled some of the location shooting on TRAVELS WITH MY AUNT, and Cukor wanted to resign in protest when he fired Hepburn; but she knew he hadn’t worked in some time and had no other immediate prospects, and insisted he stay on. Fortunately Cukor and his favorite actress were able to work together again three years late. James Costigan had written LOVE AMONG THE RUINS as a play for Alfred Lunt and Lynn Fontanne, then adapted it for a TV movie when they decided to retire. 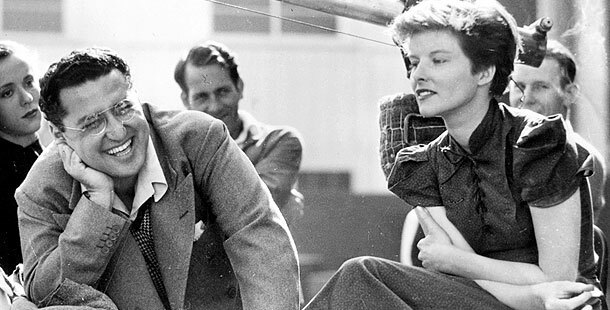 He sent the script to Hepburn, who asked Cukor to direct it and suggested Laurence Olivier for the leading man. Set in Edwardian London in 1910, Cukor’s first TV movie has the charm of a deliberately laded valentine: two gracefully mounted period movies, sophisticated star vehicles, and two richly autumnal stars who would never be so engaging and unaffected (or so perceptively directed) again. Cukor and Hepburn worked together one more time, on another TV movie, THE CORN IS GREEN. A more creaky kind of star vehicle, it appealed to the high-minded, sentimental side of Hepburn, who gave an oddly stilted performance and seemed too old for a role that Bette Davis (in spite of being too young) had made more convincing in the 1945 movie. And if Cukor’s work seemed almost routine in comparison to LOVE AMONG THE RUINS, I think private discouragement was one of the reasons. He kept up a marvelous front, but it must have been hurtful to realize that by 1979 he had to take whatever assignment he could get. Between the two TV movies, Cukor directed THE BLUE BIRD for the big screen. Maeterlinck’s fairy tale play, the basis for Maurice Tourneur’s silent movie in 1917 and a Shirley Temple vehicle in 1940, became the first American-Soviet coproduction in 1976. A brave but punishing venture for its director, who was buried under an avalanche of misfortunes: unresolved script problems, inferior technical equipment and cumbersome sets at Lenfilm Studios, cast members falling ill, infighting among the producers. Like most people, I never saw it, and Cukor hoped I never would. What Cukor inherited was another remake, an entertainingly written attempt at updating OLD ACQUAINTANCE, the John Van Druten play that became a Bette Davis-Miriam Hopkins vehicle in 1943; and he agreed to take it over because “the offers don’t exactly come fast and furious anymore,” and he couldn’t find backing for his own projects. These included a film about Virginia Woolf, with Maggie Smith, another about the splendidly eccentric Victoria Woodhull, a traveling spiritualist and feminist who became the first woman to run for U.S. President (in 1872), and an adaptation of Lesley Blanch’s novel “The Nine-Tiger Man.” During a day on the set of RICH AND FAMOUS, where I made a one-minute cameo appearance at Cukor’s request, I saw how carefully he paced himself as well as the movie, napping during the lunch break or when he learned that a change of camera set-up would take half an hour. He’d seemed somehow physically diminished after his return from Russia, and I attributed it to the five-month ordeal of THE BLUE BIRD, but like everyone except Cukor’s doctor, I didn’t know that he’d had a mild heart attack twenty years earlier, and a heart condition ever since. Mentally he was sharp and concentrated as ever; but the energy and skill he brought to the material couldn’t disguise the fact that it resisted updating. Faced with neglect and indifference in their later years, some of Cukor’s colleagues bitterly resented the new generation of directors, others took to the bottle or the desert. But Cukor never lost his appetite for new movies, and during our talks was particularly enthusiastic about Fellini’s SATYRICON, Truffaut’s STOLEN KISSES and Paul Morrissey’s TRASH. Aspiring young directors and actors came to see him and were given advice; directors visiting from Europe were given lunch, and he hosted a particularly memorable occasion when Luis Buñuel’s DISCREET CHARM OF THE BOURGEOISIE was nominated for an Academy Award as best foreign picture of 1972. Among those invited to meet Buñuel, his screenwriter Jean-Claude Carriere and producer Serge Silberman, were Alfred Hitchcock, Rouben Mamoulian, Robert Mulligan, George Stevens, Billy Wilder, Robert Wise and William Wyler. Final note: Somerset Maugham once remarked that “to write good prose is an affair of good manners.” Cukor felt the same way about making good cinema. At certain points these two artists and friends coincided. Each was prolific, shrewd, lucid, and supremely professional. Beyond this, they parted. Maugham seemed to write out of some concealed, unresolved affliction. Cukor, who came to terms with whatever personal sacrifices he had to make, lived and created with open pleasure. There are artists whose work is basically a release from private tension, and others (like Cukor) whose work is an extension, a way of expressing curiosity about the world. In both cases the cornerstones are discipline, alertness, energy. And in Cukor’s case, a quality he shared with all the finest directors: the imagination to make us see more than meets the eye.